Beth and Jennifer know their company monitors their office e-mail. But the women still spend all day sending each other messages, gossiping about their coworkers at the newspaper and baring their personal lives like an open book. Jennifer tells Beth everything she can't seem to tell her husband about her anxieties over starting a family. And Beth tells Jennifer everything, period. When Lincoln applied to be an Internet security officer, he hardly imagined he'd be sifting through other people's inboxes like some sort of electronic Peeping Tom. Lincoln is supposed to turn people in for misusing company e-mail, but he can't quite bring himself to crack down on Beth and Jennifer. He can't help but be entertained-and captivated- by their stories. But by the time Lincoln realizes he's falling for Beth, it's way too late for him to ever introduce himself. What would he say to her? "Hi, I'm the guy who reads your e-mail, and also, I love you." After a series of close encounters and missed connections, Lincoln decides it's time to muster the courage to follow his heart . . . even if he can't see exactly where it's leading him. 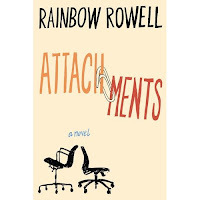 Written with whip-smart precision and charm, Attachments is a strikingly clever and deeply romantic debut about falling in love with the person who makes you feel like the best version of yourself. Even if it's someone you've never met. Let's talk a little about the plot, so yes, there are those emails I was talking about between 2 friends Jennifer (who is married) and Beth (who has a long term boyfriend). Now we get to read these emails because it is Lincoln's job to monitor the emails at the newspaper they all work at and his portion of the story is told through I guess you would call it narrative? Emails with questionable content for whatever reason (flagged words etc), go to Lincoln and he is supposed to crack down on the offenders. I bet you are thinking "Say what, that's a crazy job!" 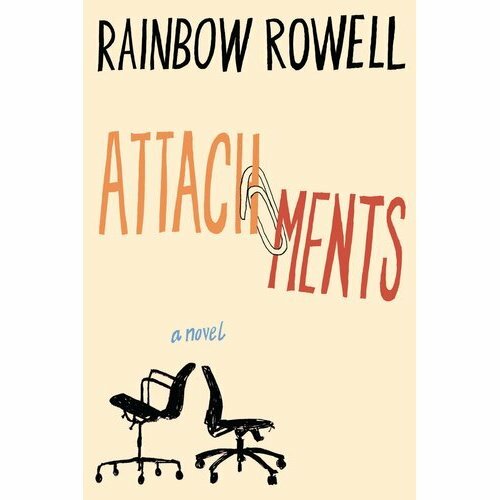 And while it is, it makes a little more sense because the book takes place in 1999. So after reading a bunch of their emails Lincoln starts to feel weird about contacting them about their conduct but can't seem to stop reading their emails and ends falls for Beth in the process. Lincoln is sort of lost in his path through life, he's gone to school A LOT, lives with his mother still (he's in his late 20s), is sort of shy and is still really affected by his one major relationship he had in his life. Basically he's a really sweet guy but no one but his small group of friends would know it and at first I don't think we the reader do either. In a lot of ways it kind of creeps me out how much I related to and understand Lincoln. And that's one thing I really loved about this book, of many. The way the story evolves just hit all the right notes for me, seeing Lincoln starting to better himself for a woman he doesn't even really know, seeing Beth really decide what to do about her relationship... I really can't put into words how just right and wonderful this book is. It made me laugh, giggle and literally cry tears of joy over the ending of this book. I was so invested in the story. There are some wonderful twists and nuances I'm dying to tell you about but it's so much more fun if you read it yourself! And oh that ending, talk about perfect, I finally realized, reading the ending, Attachments reminded me a lot of one of my favorite movies Amelie (the plot, the magic, the wonderful ending just so many things). I read the book about a month ago over about 2 super busy days (every time I was at home I was reading) and whenever I think of it or mention it my heart literally leaps, I know that sounds super cheesy but I mean it. There is no way I can do this book justice so if you are at all intrigued do yourself a favor and check it out! I try not to tell people flat out, read this book, but seriously READ THIS BOOK! And luckily enough I have the chance to give one of you a copy of this book! Fill out the giveaway entry form here. The giveaway is open to addresses within the U.S. and Canada only. The giveaway will end May 19th at 6:59 pm Central Time. Entries left in the comments of this blog post will not be counted, please fill out the giveaway entry form. Your favorite of all time? I need to pull this one off the shelf! Yay! After I read Sarah's review I was hoping you'd do one too! =) Loved reading your thoughts about it. WOW all time favorite!!?? That's so crazy given the number of books you read!! I'm thrilled that you enjoyed it so much. Thank you for being on the tour and sharing it with your readers! Thanks for the review. Sounds like a good read. Hi, I really enjoy reading your blog and would like to pass along The Lovely Blog Award.